For the last couple of years, resolution has been the key battleground in television specs. Now one Dolby executive has indicated that the next battleground might be over brightness rather than pixels. Speaking at CES 2017, Dolby’s Vice President of Technology, Patrick Giffis, said that he expects television manufacturers to now start competing with one another to produce the brightest displays. Although the current standard that needs to be reached for Ultra HD Premium's HDR specification is 1,000 nits (where one nit is equal to the amount of light a candle produces), Giffis believes television manufacturers will soon go much higher. “Have no doubt about it, the nits race is on. It will be 2,000 nit displays, and I suspect before too long, 4,000 nit consumer displays,” he said. Brightnesses above 1,000 nits might not initially seem that beneficial, but Giffis said that going beyond this brightness would have a positive impact upon a television’s colors, allowing them to become much richer and more saturated. This happens because of the fact that the color white is made up of the full brightness of its constituent colors. That means that, for example, the brighter a blue pixel gets, the closer it gets to white. By limiting the brightness of a white pixel to 1,000 nits, you limit how bright a blue pixel can get before losing its color and turning into white. A brighter display allows colored pixels to maintain good color saturation even at bright levels. In fact, the executive cited Dolby experiments which said that viewers can perceive a brightness benefit in excess of 10,000 nits, ten times the current UHD Alliance HDR brightness specification. Currently Dolby Vision, the company’s HDR standard, is mastered at 4,000 nits. We’re already seeing evidence of this race taking place. LG’s latest flagship is advertised as being 15 percent brighter than last year’s OLEDs, and Samsung’s new QLED sets offer a peak brightness of between 1,500 and 2,000 nits. 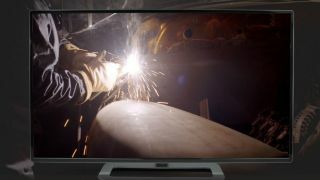 So when you’re looking to next upgrade your television keep an eye on its maximum brightness, because it might end up being the new battleground now that 4K resolutions have gone mainstream. New year, new tech – check out all our coverage of CES 2017 straight from Las Vegas, the greatest gadget show on Earth.